Few years ago, I wouldn’t even think about applying snail slime on my face. I was breeding snails only in my garden and fed them with some cheese. 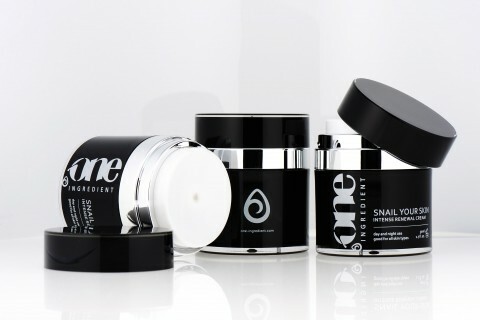 Now, my love for natural methods of skin care reached the stage, where I buy creams with snail slime for 45£ for 1.7 Oz.! What properties does Snail Your Skin from One Ingredient have? I invite you to read about it below. Snail Your Skin is an Intense Renewal Cream, which consists of 80% of natural snail slime from organic breeding, enriched with few active ingredients like: damask rose water, oil from wild rose fruits and macadamia oil. All of those vegetable extracts are well known and often used in other cosmetics or directly as a conditioning product. At first I was scared only by the snail slime, but it turned out there was nothing to be afraid of. Especially, that slime is extracted in a non-invasive way, so no snail was harmed in production of Snail Your Skin. This is a great news for vegans and animal lovers like myself. Brand promises almost everything, though, when we pay this much money for product then we expect it to have complex properties. Snail Your Skin is an Intense Renewal Cream, which should provide moisture, rejuvenation, regeneration of the skin, reduction of wrinkles, make skin elastic, smoother, tightening of pores, regulation of sebum secretion, skin cleanse, exfoliate dead skin cells, eliminate acne, discolourations or scars and even prepare skin for make-up. All I can say about Snail Your Skin is that it really works. I’m not joking, all enumerated by me effects were visible after first application of cream. One Ingredient ensures us that it is all thanks to concentrated formula and of course rich properties of snail slime. And what are those properties? Valuable snail slime is a source of all the most important for skin ingredients: collagen, elastin, hyaluronic acid, vitamin complex, micro-elements, but also bio-stimulating cell renewal enzymes. Intense Renewal Cream Snail Your Skin is an organic cosmetic, what was confirmed by Ecocert. There are no artificial or unpleasant for skin ingredients. For this one reason, you should try snail slime in your skin care. What is in my make-up bag? Beauty products.